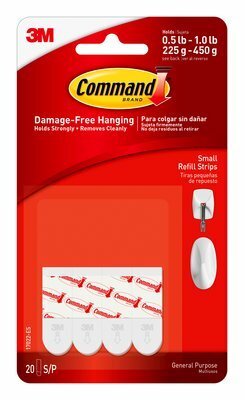 Command™ Small Refill Strips is rated 4.8 out of 5 by 21. Rated 5 out of 5 by aseret from great thanks 3M sent me a sample of these to try and evaluate. I love them! Thank you! 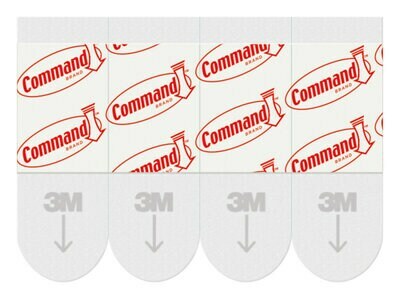 Rated 5 out of 5 by Ashley576 from great 3M sent me a sample of these to try. I love them! Thank you! Rated 5 out of 5 by Diesel from Poster Strips that Saves my Rent Deposit I have used the strips to hang some pictures and calendars in the apartment that I am renting. They peeled off easily without making any wall damage. I am so glad I tried this. Rated 5 out of 5 by Keiah from I honestly love this product. I can say it does work really well. I have been using these refill strips on the back off my posters for years in my dorm. Really good for dorm use because it doesn't damage your walls. I would definitely recommend this product to others. Rated 5 out of 5 by Bamagrits from Small-Poster size strips I use these strips with the small wire hooks and hang my lightweight door wreath with them. I am very pleased with the way they hold especially being outside and in cold weather. They remove easily when I am done. They are great inside the house too, especially for people like me who have commitment issues when decorating the walls. I recently received a sample of them from the company but I have been using them for years and have always loved the product.